Office 365 Backup now available in the Azure Marketplace! When we released Veeam Backup for Microsoft Office 365 in July, we saw a huge adoption rate and a large inquiry on running the solution within Azure. It is with great pleasure, we can announce that Veeam Backup for Microsoft Office 365 is now available in the Azure Marketplace! 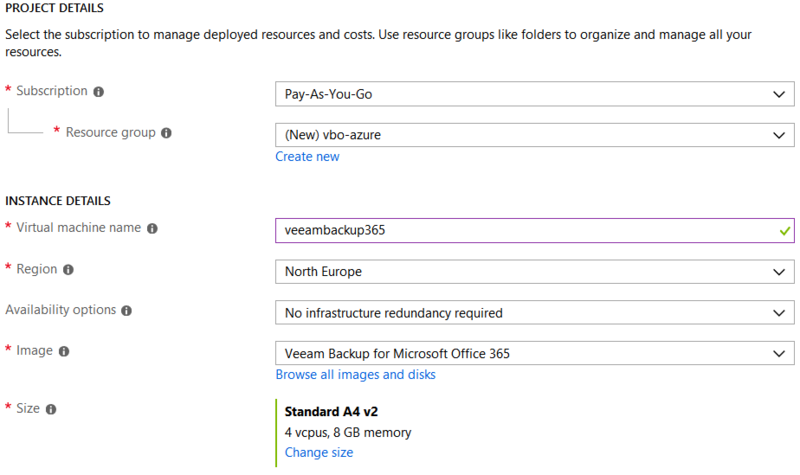 Veeam Backup for Microsoft Office 365 within Azure falls under the BYOL (Bring Your Own License) model, which means you only have to buy the amount of licenses needed besides the Azure infrastructure costs. The deployment is easy. Just define your project and instance details combined with an administrator login and you’re good to go. You will notice a default size will be selected, however, this can always be redefined. Keep in mind it is advised to leverage the minimum system requirements which can be found in the User Guide. Once you’ve added your disks and configured the networking, you’re good to go and the Azure portal will even share you details on the Azure infrastructure costs such as the example below for a Standard A4 v2 VM. If you are wondering on how to calculate the amount of storage needed for Exchange, SharePoint and OneDrive data, Microsoft provides great reports for this within the Microsoft 365 admin center under the reports option. Once the VM has been deployed, you can leverage RDP and are good to go with a pre-installed VBO installation. Keep in mind that by default, the standard retention on the repository is set to 3 years, so you may need to modify this to adjust to your organization’s needs. You can provision Veeam Backup for Microsoft Office 365 in Azure and bring a 30-day trial key with you to begin testing. You can also deploy the solution within Azure and back up all your Office 365 data free forever – limited to a maximum of 10 users and 1TB of SharePoint data within your organization. Ready to get started? Try it out today and head to the Azure Marketplace right now! The post Office 365 Backup now available in the Azure Marketplace! appeared first on Veeam Software Official Blog. The post Native Snapshot Integration for NetApp HCI and SolidFire appeared first on Veeam Software Official Blog. Be very careful of any lost USB drives you may find (such as in the parking lot or local coffee shop) or USB drives you are given at public events, like conferences. It is very easy for these devices to be infected with malware. Never use such devices for work, use only authorized devices issued to you by work. The post Windows Server 2019 and what we need to do now: Migrate and Upgrade! appeared first on Veeam Software Official Blog. Unfortunately, bad patches are something everyone has experienced at one point or another. Just take the most recent example of the Microsoft Windows October 2018 Update that impacted both desktop and server versions of Windows. Unfortunately, this update resulted in missing files for impacted systems, and has temporarily been paused as Microsoft investigates. Because of incidents like this, organizations are often seldom to quickly adopt patches. This is one of the reasons the WannaCry ransomware was so impactful. Unpatched systems introduce risk into environments, as new exploits for old problems are on the rise. In order to patch a system, organizations must first do two things, back up the systems to be patched, and perform patch testing. Before we patch a system, we always want to make sure we have a backup that matches our organization’s Recovery Point Objective (RPO), and that the backup was successful. Luckily, Veeam Backup & Replication makes this easy to schedule, or even run on demand as needed. Beyond the backup itself succeeding, we also want to verify the backup works correctly. Veeam’s SureBackup technology allows for this by booting the VM in an isolated environment, then tests the VM to make sure it is functioning properly. Veeam SureBackup gives organizations additional piece of mind that their backups have not only succeeded, but will be useable. Veeam DataLabs enable us to test patches rapidly, without impacting production. In fact, we can use that most recent backup we just took of our environment to perform the patch testing. Remember the isolated environment we just talked about with Veeam SureBackup technology? You guessed it, it is powered by Veeam DataLabs. Veeam DataLabs allows us to spin up complete applications in an isolated environment. This means that we can test patches across a variety of servers with different functions, all without even touching our production environment. Perfect for patch testing, right? Now, let’s take a look at how the Veeam DataLab technology works. Veeam DataLabs are configured in Veeam Backup & Replication. Once they are configured, a virtual appliance is created in VMware vSphere to house the virtual machines to be tested. Beyond the virtual machines you plan on testing, you can also include key infrastructure services such as Active Directory, or anything else the virtual machines you plan on testing require to work correctly. This group of supporting VMs is called an Application Group. In the above diagram, you can see the components that support a Veeam DataLab environment. Remember, these are just copies from the latest backup, they do not impact the production virtual machines at all. To learn more about Veeam DataLabs, be sure to take a look at this great overview hosted here on the Veeam.com blog. So what happens if we apply a bad patch to a Veeam DataLab environment? Absolutely nothing. At the end of the DataLab session, the VMs are powered off, and the changes made during the session are thrown away. There is no impact to the production virtual machines or the backups leveraged inside the Veeam DataLab. With Veeam DataLabs, patch testing is no longer a big deal, and organizations can proceed with their patching activities with confidence. This DataLab can then be leveraged for testing, or for running Veeam SureBackup jobs. SureBackup jobs also provide reports upon completion. To learn more about SureBackup jobs, and see how easy they are to configure, be sure to check out the SureBackup information in the Veeam Help Center. The hesitance to apply patches is understandable in organizations, however, that does not mean there can be significant risk if patches are not applied in a timely manner. By leveraging Veeam Backups along with Veeam DataLabs, organizations can quickly test as many servers and environments as they would like before installing patches on production systems. The ability to rapidly test patches ensures any potential issue is discovered long before any data loss or negative impact to production occurs. What about the other assets in your environment that can be impacted by a bad patch, such as physical servers, dekstops, laptops, and full Windows tablets? You can still protect these assets by backing them up using Veeam Agent for Microsoft Windows. These agents can be automatically deployed to your assets from Veeam Backup & Replication. To learn more about Veeam Agents, take a look at the Veeam Agent Getting Started Guide. To see the power of Veeam Backup & Replication, Veeam DataLabs, and Veeam Agent for Microsoft Windows for yourself, be sure to download the 30-day free trial of Veeam Backup & Replication here. The post How to Enable Rapid Patch Testing with Veeam Backups and Veeam DataLabs appeared first on Veeam Software Official Blog. The post Considerations in a multi-cloud world appeared first on Veeam Software Official Blog. After you have installed Veeam Availability Orchestrator, the first site you configure will be your DR site. If you are also deploying production sites, it is important to note, you cannot change your site’s personality after the initial configuration. This is why it is so important to plan before you install, as we discussed in the first article in this series. If you change your mind and do in fact want to use an existing Veeam Backup & Replication server, it is very easy to install the agent after initial configuration. 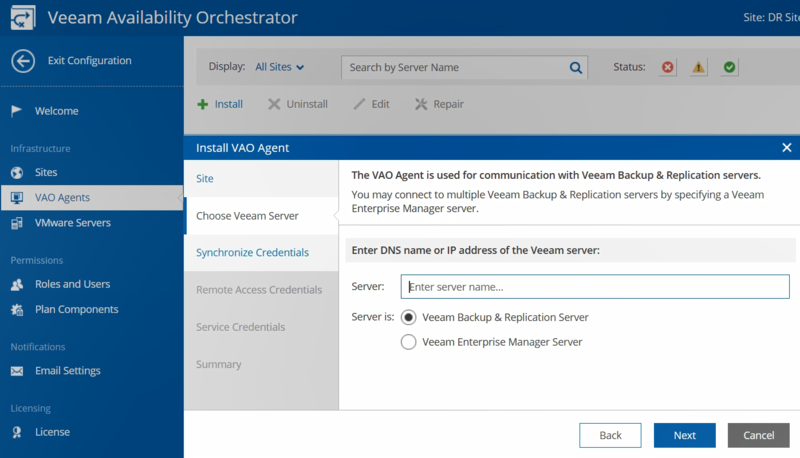 In the Veeam Availability Orchestrator configuration screen, simply click VAO Agents, then Install. You will just need to know the name of the Veeam Backup & Replication server you would like to add and have the proper credentials. No matter which Veeam Backup & Replication server you choose to use for Veeam Availability Orchestrator, it is important to ensure your replication jobs are configured in Veeam Backup & Replication before you get too far in configuring your Veeam Availability Orchestrator environment. After all, Veeam Availability Orchestrator cannot fail replicas over if they are not there! If for some reason you forget this step, do not worry. Veeam Availability Orchestrator will let you know when a Readiness Check is run on a Failover Plan. As the last step in creating a Failover Plan, Veeam Availability Orchestrator will run a Readiness Check unless you specifically un-check this option. If you did forget to set up your replication jobs, Veeam Availability Orchestrator will let you know, because your Readiness Check will fail, and you will not see green checkmarks like this in the VM section of the Readiness Check Report. For a much more in-depth overview of the relationship between Veeam Backup & Replication and Veeam Availability Orchestrator, be sure to read the white paper Technical Overview of Veeam Availability Orchestrator Integration with Veeam Backup & Replication. Before you can run a Virtual Lab Test on your new Failover Plan (you can find a step-by-step guide to configuring your first Failover Plan here), you must first configure your Veeam DataLab in Veeam Backup & Replication. If you have not worked with Veeam DataLabs before (previously known as Veeam Virtual Labs), be sure to read the white paper I mentioned above, as configuration of your first Veeam DataLab is also covered there. After you have configured your Veeam DataLab in Veeam Backup & Replication, you will then be able to run Virtual Lab Tests on your Failover Plan, as well as schedule Veeam DataLabs to run whenever you would like. Scheduling Veeam DataLabs is ideal to provide an isolated production environment for application testing, and can help you make better use of those idle DR resources. Veeam DataLabs can be run on demand or scheduled from the Virtual Labs screen. When running or scheduling a lab, you can also select the duration of time you would like the lab to run for, which can be handy when scheduling Veeam DataLab resources for use by multiple teams. There you have it, even more tips and tricks to help you get Veeam Availability Orchestrator up and running quickly and easily. Remember, a free 30-day trial of Veeam Availability Orchestrator is available, so be sure to download it today! The post More tips and tricks for a smooth Veeam Availability Orchestrator deployment appeared first on Veeam Software Official Blog. I am thankful for the opportunity to attend this year’s Grace Hopper Celebration where I could learn from and lean in with some of the greatest minds in tech. Having been hands-on in service provider land for the entirety of my career prior to joining Veeam, I understand the pain points that come with offering backup and recovery services. I’ve spent countless hours working on getting the best combination of hardware and software for those services. I also know firsthand the challenges that storage platforms pose for architecture, engineering and operations teams who design, implement and manage these platforms. An immutable truth that exists in our world is that backup and storage go hand in hand and you can’t have one without the other. In recent times, there has been an extreme growth in the amount of data being backed up and the sprawl of that data has also become increasingly challenging to manage. While data is growing quicker than it ever has, in relative terms the issues created by that haven’t changed in the last ten or so years — though they have been magnified. Focusing on storage, those that have deployed any storage platform understand that there will come a point where hardware and software constraints start to come into play. I’ve not yet experienced or heard of a storage system that doesn’t apply some limitation on scale or performance at some point. Whether you are constrained by physical disk or controller based limits or software overheads, the reality is no system is infinitely scalable and free of challenge. The immediate solution to resolve these challenges in my experience (and anecdotally) has always been to throw more hardware at the platforms by purchasing more. Whether it be performance or disk constraints, the end result is always to expand capacity or upgrade the core hardware components to get the system back to a point where it’s performing as expected. That said, there are a number of systems that do work well, and if architected and managed in the correct way will offer longer term service sustainability. When it comes to designing storage for backup data, the principals that are used to design for other workloads such as virtual machines cannot be applied. Backup data is a long game and portability of that data should be paramount when choosing what storage to use. Veeam offers tights integration with a number of top storage vendors via our storage integrations. Not only do these integrations offer flexibility to our customers and partners, but they also offer absolute choice and mobility when it comes to the short and long-term retention of backup data. Extending that portability message — the way in which backup data is stored should mean that when storage systems reach the end of their lifetime, data isn’t held a prisoner to the hardware. Another inevitability of storage is that there will come a time when it needs replacing. This is where Veeam’s hardware agnostic, software-defined approach to backup comes into play. Recently, there have been a number of products that have come into the market that offer an all-in-one solution for data protection in the form of software tied to hardware appliances. The premise of these offerings is ease of use and single platform to manage. While it’s true that all-in-one solutions are attractive, there is a sting in the tail of any platform that offers software that is tied to hardware. Fundamentally, the issues that apply to storage platforms apply to these all-in-one appliances. They will reach a point where performance starts to struggle, upgrades are required and, ultimately, systems need to be replaced. This is where the ability to have freedom of choice and a decoupled approach to software and hardware ultimately results in total control of where your backup data is stored, how it performs and when that data is required to be moved or migrated. You only achieve this through backup software that’s separated from the hardware. While it might seem like a panacea to have an all-in-one solution, there needs to be consideration as to what this means three, five or ten years into the future. Again, portability and choice is king when it comes to choosing a backup vendor. Lock in should be avoided at all costs. The post Why our software-driven, hardware agnostic approach makes sense for backups appeared first on Veeam Software Official Blog.